Add another layer of creative magic and add some bespoke signature sounds to your mix with the Pioneer DDJ-XP1 Controller For Rekordbox DJ And DVS. This excellent add-on controller features 32 performance pads, slide effects, key shift capability, silent cue and more. Combine the DDJ-XP1 with your turntable or controller using the included Rekordbox DJ and DVS software for some serious tactile control. The top panel of the DDJ-XP1 presents you with a very clean layout - an upper section gives you access to key control, sample bank selection, beat sync status, active loop control and quick changes between the 3 banks of slide FX. 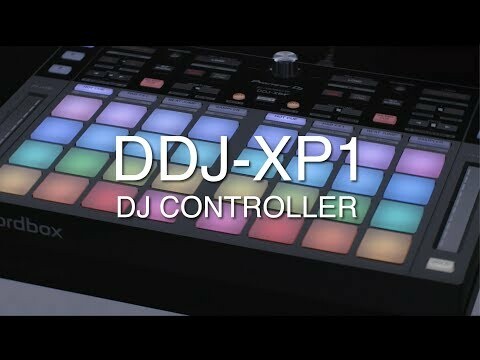 The lower section of the DDJ-XP1 is dedicated to 32 multi-coloured performance pads. The performance pads of the DDJ-XP1 help you craft a totally bespoke set by pushing Rekordbox to its limits. These tactile pads also boast incredibly low latency so that your samples can be triggered with incredible precision. Even gig after gig after gig, these rugged pads will stand the test of time as you would expect from a premium company such as Pioneer. The DDJ-XP1 gives you dynamic control over any combination of effects that you choose simply by sliding your finger up and down the touch strip. No need to activate effects, simply select your combo and begin making magic. A hold button also means you can lock the effects in until you use the slide again. Included with the Pioneer DDJ-XP1 is a licence key for both Rekordbox Dj and Rekordbox DVS software packages. Load onto your dual core Mac or PC with a minimum 4GB of RAM, connect the DDJ-XP1 and start DJing from your library of music. finally, the DDJ-XP1 has a built in Key Shift function that can change the key of your next track to match the master deck and shift keys up or down to mix any combination of tracks in the perfect key.